23 Mar 2018(morning)..Westerly winds effect ..
PARTS OF MAHARASHTRA COOL DOWN.. 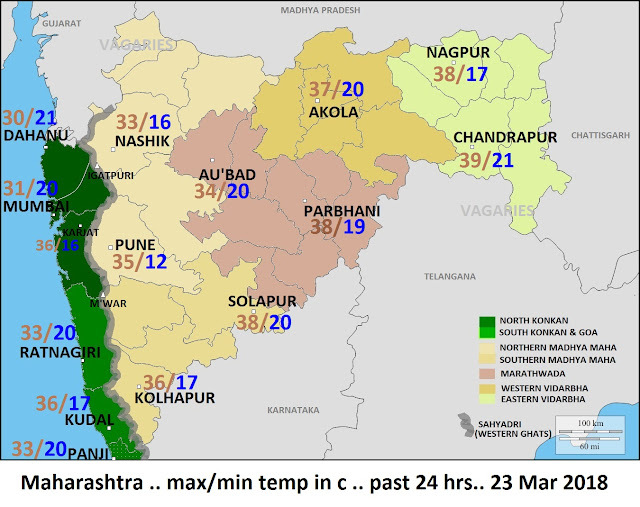 ..Private AWS(unofficial) reported a chilly 3.3 c min temp at Mahabaleshwar today morning .. Bopardi(lee area) reported a chilly 7.6 c ..Gaganbawda reported a cold 9 c .. Amboli reported a cold 10.6 c ..
Badlapur(private reading) max temp 35.7c & min temp was 18.1c today. Yesterday saw max of 34.8c & min was 18c ! Cooler night & comfortable day time is over now ! As from tomorrow temp set to rise due easterlies land breeze effect. Sunday & Monday may remain more hotter with heat wave like conditions. Mumbai may see temp till 39c on Sun-Mon(depending upon sea breeze timing, 40c touch and go may be possible) .From Tuesday temp to reduce with early setting of West breeze. Rayalseema - Tirupathi, Kurnool already exceeding 40c ! Many report suggest in few years need to evacuate Bangalore - no water! Time weather scientist,environment minister, IIT, IISc, ISRO come together to take corrective action for water conservation,tree plantation - can land support blowing population? We are hearing parts of Mumbai suburbs have hit 40 degrees today then cooling down later this week..